Rather, it’s a city stretching forward, according to Culture Keeper contributor Roshanda Cummings. Close your web browsers and your guidebooks. Erase your search history. Forget everything you’ve heard about Cuba and what you assume has happened to it as relations have begun to warm between America and this neighboring island nation. Since the Bay of Pigs, what Cuba was in the Western imagination got tangled in the American mind. From our Cold War hangover we inherited notions of backwardness because the Soviet Union, with whom Cuba’s leader aligned it, ultimately fell in 1991 while capitalism soldiered on. Perhaps it’s accurate to say that Cuba did get stuck over time. After all, car imports stopped in 1959, and between the U.S. embargo and Castro’s policies things woven deeply into the West’s cultural quilt didn’t enter Cuba’s: MTV, CDs and discmans, Coca-Cola, billboards, AOL. But by 2017 in ostensibly unstuck America, I was longing for this pre-modern world. Where was the place where corporations couldn’t mine your information to sell it back to you? Where was the place without strategically placed images of tragically stylish people to be compared to? After we booked our tickets to fly to Cuba in February, every day I got more excited about witnessing a time capsule! Airbnb’s announcement of expansion to Havana had deeply concerned me (who on earth needed more people like me with iPhones and panama hats and polite inquiries to wait staff to ask if menu options were gluten-free? ), but I also had a deep desperation to get there before the simple society of my imagination was spoiled. I wanted to see those vintage Chevys and people listening to radios instead of Pandora. I wanted to walk down streets where (I had heard) people danced in the open air because what else was there to do? 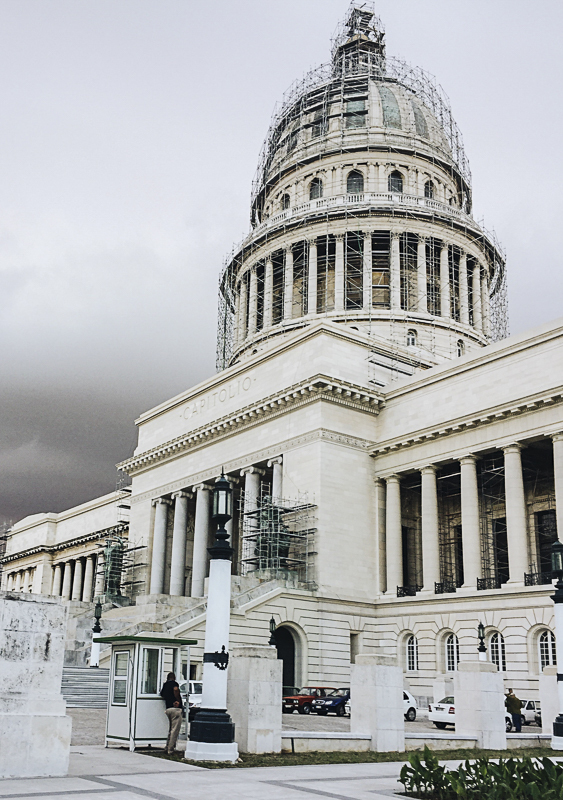 Since the Cuban government still requires all travelers to pick one of 12 legitimate reasons for visiting the island, we followed the guidance of our Spirit Airlines flight attendants and circled number five. Education. Other than being one of the most unruly one-hour flights I’ve ever been on (sidenote: are airline employees allowed to use their cell phones the entire flight, and are flight attendants allowed to flirt with these airline employees? ), the ride gave me no hint of whether I would find a living culture or frozen culture awaiting us on the ground. Had I packed enough gifts of soap, pencils, and home goods to give our Airbnb hosts and the children asking for them on the street? Should I have purchased some vintage sundresses to better fit in with what I assumed to be a 1960s aesthetic? Was there going to be any Wi-Fi for letting our families know we had arrived? Surely in the airport, right? Outside, the cars idling around the airport were everything I expected—huge hulking things, customary curves. But what I ultimately found comforting was what I hadn’t expected: the conventionality of them, really. They were automobiles: you know, modes of transportation we use to help us in the very practical tasks of living. After five minutes, the famous cars quickly faded into the background of our experience, and I barely registered them the rest of the trip. Leaving the airport, Cuban salsa rang from the radio as we two travelers, smiling and sweaty, took in the scene outside. Dotting the landscape: billboards praising Castro and celebrating Cuban independence from all occupiers. In a way, how were these any different from billboards asking citizens to pray for George Bush or proclaiming “these stripes don’t run”? That night we fell sleepily into bed in our stunning casa. Our Airbnb host Roberto had run us ragged during the hottest part of the day showing us our neighborhood in Vedado: the Wi-Fi park, the schools where students earn medical degrees for free, an independent contemporary art museum, and the first North Korean Embassy we had ever seen. I was most interested by the Wi-Fi park—simply an unmarked public square in the middle of a neighborhood that had every kind of person dotting the square on benches missing slats, with laptops balanced on laps or holding phones’ cameras to catch both grandparents for their video chat with grandchildren. In the morning, after café con leche and fresh fruit, we wandered our neighborhood in the heat of the day. Flanking the streets were huge estates, some falling apart but most intact and full of people living their lives. These were people who wore the latest fashions. Young people in skinny jeans with bejeweled pockets à la Miami, women in tight tank tops and crisp capris, and the older generation in fresh-pressed slacks and polo shirts fit for the weather. In the evening on the Malecón, the long stretch of waterfront, hoards of young people crowded outside clubs and in the shadows of buildings to make moves on each other. In the cooling evening, I noticed the young men’s bouffants, the classic look updated with loops of chain necklaces, ripped jeans, and gold-rimmed sunglasses. Their girlfriends wore tight dresses to show off their forms. Blue faces glowed, for most had cell phones pulled from their pockets checking messages and alerts. I wondered where I had gotten my vague notion that courtship or even young people would look different here. What did I have in mind? Hot rods and… Grease..? Throughout the week we explored recommended spots that the growing hip subclass of Cuban society haunts in the evenings, and each place was so stunningly cool, each in their own way, with eclectic decor and novel experiences for drinks while watching the skyline over Habana Vieja or the setting sun over the coast. La Guarida is so esteemed--it has been visited by Obama, Beyoncé, and Jay Z—that the place is now swamped every weekend. But honestly, we struggled to see anything serving up local fare. Though on every block we found new paladares, independently owned restaurants, they were mostly serving pizza! This wasn't the Cuba I was expecting. Sure, you could really only find Wi-Fi at the Wi-Fi park, but at least there was Wi-Fi. Sure, some of the shopping malls out by Avenida 1 had a few floors without storefronts, but the busiest mall we wandered through in Vieja was filled with people shopping under glittery signs for Heidi Klum fragrances or watching their children play in food courts not too different from the ones frequented by American parents appeasing their own excited children. We didn’t made it to La Fabrica de Arte Cubano, the hip industrial space we’d heard so much about, but people raved about its live music on the weekends and art productions for the edgier, hipper, emerging Cuba. I mean, for all there was the say about the peeling infrastructure in some areas, I no longer could justify any of the impressions I thought I'd have about this country or this city. Cuba may have gone through much in its revolution, but evidence that it had frozen in time for the past several decades were just nonexistent in Havana. When I spoke with Cubans through my struggling Spanish, what I could understand was that they shared deep love of America and insisted their affections had been there for years (“How could we not! We all have family there!”). What was on their minds, however, was what would happen to them now that a new U.S. commander in chief is in office. To them, Obama had been one step forward while Trump was two steps back. Packing up on our last night, I wished I’d had more time to be here and learn. Cuba wasn’t the time capsule I’d thought I wanted. Instead it was a dynamic culture situated somewhere in the middle between preservation and innovation, with the capacity politically and socially to decide both. Some of its present parts I wished someone could freeze, though: the way Cuban social life still revolves around neighbors and family out on the streets. That internet is something to hop onto in your spare time instead of a feature of every eating establishment and tenement. Even how the work day ends when night falls, at which time you can go out and do whatever you want with whomever you deem worth your time. However, nothing about Havana is stuck in time, and I imagine that with the continuous influx of tourists, it will twist and evolve in ways Cubans will both cherish and ultimately reflect on with chagrin. As history and individuals do, though, Havana and Cuba at large are stretching forward, like we all are.